Every painstaking movement of the second hand on the round 1970s style clock in the front of the classroom deepened the soul-destroying angst in Mr. Nocontext’s being. Mr. Jobkiller, the school’s new principal, had come to observe. And the short story lesson plan for the “Most Dangerous Game” wasn’t going well. The lesson itself wasn’t the problem. In fact, Nocontext got it from the best ELA Common Core Website in the Universe. This introductory lesson plan takes about 5-10 minutes, is easy to prepare, and gets students thinking about the story. Draw a giant box on the board. Write the title of the story in the giant box. On the outside of the box, write 8-10 words that have something to do with the story. Instruct students to predict what will happen in the story they’re about to read, using the words written outside the box. 5-10 minutes should suffice. Depending on which standards you wish to address, you can require it to be written in paragraph form or as a list. You can also require certain types of sentences (simple, compound, complex, compound-complex) or certain types of punctuation (use a colon or a semicolon, for example) to cover language or writing standards. After the predictions are written, instruct students to partner up and go over their predictions with a teammate. Have a few students share their predictions with the class. You are now ready to read the story with students who are engaged. Here’s my example from “The Most Dangerous Game” by Richard Connell. I projected an image into my box of Zaroff from the Most Dangerous Game movie, made some time around the turn of the 15th-century. “The Most Dangerous Game” is written in the box. The following words are written around the box: boredom, hunters, mansion, survival, Ship Trap Island, murder, jungle, Death Swamp, civilization, dogs. If you’re interested in my entire “Most Dangerous Game” unit, check out the MDG Teacher’s Guide, sure to engage students for many days. “The Most Dangerous Game” Teacher’s Guide includes lesson plans with common core objectives, graphic organizers, vocabulary words, essay organizers and an annotated copy of the story, annotated by an actual teacher, who knows how to engage actual students. Buy it. It’s only $5.95. 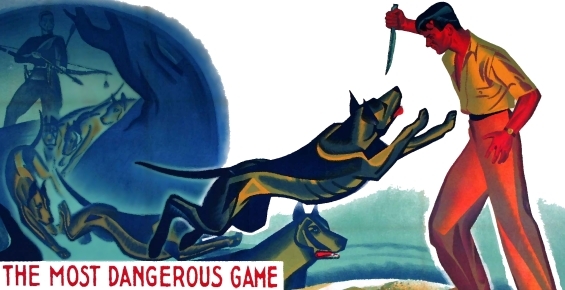 You may also want to check out these additional “Most Dangerous Game” free lesson plans. Just in case you need to document the ELA Common Core Standards. This lesson is more of an introductory lesson to a short story that will allow you to teach many common core standards. If you don’t add any standards to the assignment (as previously mentioned), you can always stick these in your lesson plan book. RL.9-10.10. By the end of grade 9, read and comprehend literature, including stories, dramas, and poems, in the grades 9-10 text complexity band proficiently, with scaffolding as needed at the high end of the range. By the end of grade 10, read and comprehend literature, including stories, dramas, and poems, at the high end of the grades 9-10 text complexity band independently and proficiently.